That’s all Adam Steinbeck demands of his wife. Thirty days in a remote cottage, doing everything he demands. After that, he’ll sign her divorce papers and give her complete ownership of their company. That’s how long he has to rediscover the man he once was. The Dominant Master he hid when he fell in love with her five years ago. She wants the business they built badly enough to go to the cottage for a month. Cut off ties to the world and do his bidding. She can submit to him with her body, but her heart will never yield. She thinks this is his pathetic attempt to repair their marriage. "The world we inhabited wasn’t designed for people to be in love. It was designed for intensity, pain, pleasure, courtesy, and ritual." 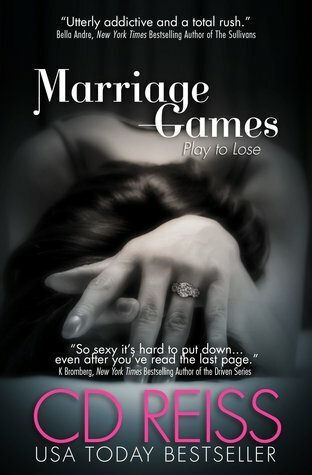 Marriage Games (Kindle Location 584). This book will mess with your head. It brings up feelings... so, so many feelings. Adam and Diana are enigmatic. There is love between them, but this is not a lighthearted romance with a convenient HEA for dessert. This book takes on a Herculean task of dissecting a marriage, bound and ruined by the protective lies and boundaries these two have set themselves. It's devastating in its brutal honesty, forbidding in its denial, and full of discovery - perhaps too late found to salvage anything worthwhile... Time will tell (or rather the next installment -- Separation Games will be out January 2017). I can't wait to read it! :-) hopefully after Christmas. Love her writing and that there are no easy choices. Might as well wait till January so you can read Book #2 without the wait!!! :) I had no will power apparently. Now experiencing a total book hangover.